Hungarian-French artist Victor Vasarely (1906-1997) had one of the most easily recognized styles of twentieth century art. Victor Vasarely prints and paintings are famous for creating optical illusions, and Vasarely was instrumental in the development of the Op-art movement during the 1950's and 1960's. 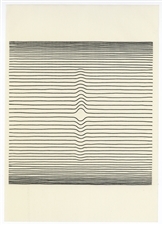 Op Art, also known as Optical Art, challenges the viewer's sense of space and perspective, using both color and black & white compositions. 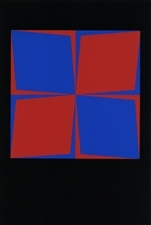 At AffordableArt101 we are proud to offer a good selection of Vasarely silkscreens and serigraphs, as well as fine prints by other artists associated with Op Art, including Richard Anuszkiewicz, Yaacov Agam and Josef Albers. Medium: silkscreen in three colors (red, blue and black). A beautiful, rich impression, printed in Germany and published in 1965 by Galerie der Spiegel in an edition of 600. Size 9 x 6 inches (230 x 155 mm). Not signed. Medium: serigraph. This Vasarely serigraph (after the painting) was published in 1959 in an edition of 200, for the rare "Geh durch den Spiegel" portfolio. Sheet size: 14 3/4 x 10 inches. 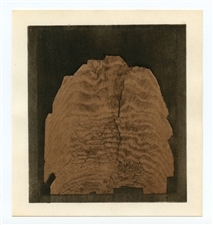 There is another image on verso, as issued. Not signed. Medium: color silkscreen. Printed in Germany and published in 1961 by Galerie der Spiegel. Issued in an edition of 300, for the rare "Geh durch den Spiegel" portfolio. Image size 13 x 6 1/2 inches (330 x 167 mm); Sheet size 14 3/4 x 9 3/4 inches (373 x 250 mm). A beautiful, richly inked impression on quality wove paper. Not signed. Medium: color silkscreen. Printed in Germany and published in 1961 by Galerie der Spiegel. Issued in an edition of 300, for the rare "Geh durch den Spiegel" portfolio. Image size 7 5/8 x 8 inches (193 x 202 mm); Sheet size 14 3/4 x 9 3/4 inches (373 x 250 mm). A beautiful, richly inked impression on quality wove paper. Not signed. Medium: color silkscreen. Printed in Germany and published in 1959 by Galerie der Spiegel. Issued in an edition of 200, for the rare "Geh durch den Spiegel" portfolio. Image size 7 x 6 1/4 inches (173 x 160 mm); Sheet size 14 x 9 3/4 inches (360 x 250 mm). A beautiful, richly inked impression on quality wove paper. Not signed. Medium: serigraph. This Vasarely serigraph (after the painting) was published in 1961 in an edition of 300, for the rare "Geh durch den Spiegel" portfolio. Image size 7 7/8 x 6 1/4 inches (200 x 160mm); the total sheet size is 14 3/4 x 10 1/4 inches (377 x 258mm). There is text on verso, as issued. Not signed. Medium: pochoir. 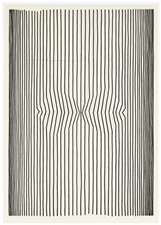 A rich impression on wove paper, this exquisite Vasarely pochoir was printed by Jacomet and issued in 1958 for the hard-to-find XXe Siecle (No. 10), published in Paris by San Lazzaro. Sheet size: 12 3/8 x 9 1/2 inches (315 x 242 mm). Not signed. Medium: serigraph. This Vasarely serigraph (after the painting) was published in 1961 in an edition of 300, for the rare "Geh durch den Spiegel" portfolio. Sheet size: 14 3/4 x 10 inches (377 x 257 mm). 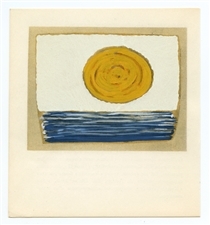 There is another image on verso, as issued. Not signed. Medium: screenprint in black on a transparent plastic sheet (after the drawing). 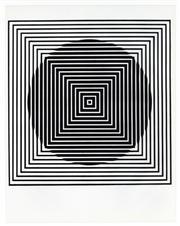 This fascinating Vasarely was printed in Switzerland in 1969 on a flexible, clear mylar sheet. The total size is 11 1/2 x 9 inches (293 x 239 mm) -- there are no margins. Not signed. Condition: there is minor clouding to the material with age; and also a small tear in the plastic near the right edge of the design. Photographed against a white background. Condition: there is minor clouding to the material with age. Photographed against a white background. Medium: serigraph / silkscreen. Published in 1964 by Galerie Denise Rene, of Paris, for the rare exhibition catalogue "Hard Edge". Victor Vasarely was one of several artists who contributed original silkscreens for this project (after their own paintings). It was printed by the Imprimerie Mazarine on a sheet of thin wove paper without margins, and then tipped onto a support sheet (attached along the top edge). Image size: 7 1/2 x 5 1/2 inches (205 x 160mm). Not signed. Condition: there is a small spot on the paper near the center of the image. 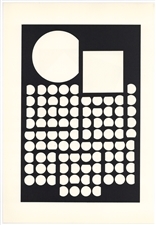 AffordableArt101 offers hard-to-find Victor Vasarely silkscreens and prints at wholesale prices.